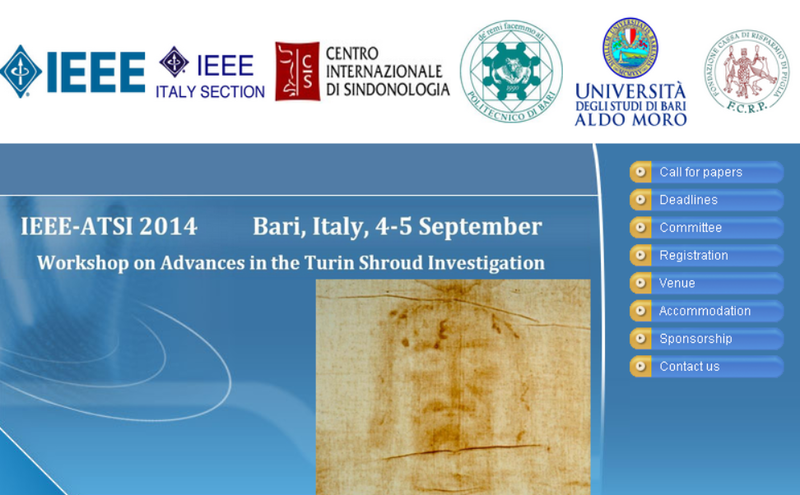 The Program for Workshop on Advance in the Turin Shroud Investigation is now online. Note that regular papers are limited to 20 minutes for presentation and 10 minutes for discussion. This seems a stark contrast to the way the St. Louis conference will be doing things: not allowing questions at the time of presentations but having a Q&A online facility that will be open to the public. Looks like a good conference. of Villa Gualino (Turin, March 2000). of analyses (= AFM, CFM, SNOM and Raman). for TLs [= thin layers] on linen fibrils involved in BIF = Body Image Formation). (= “Shroud of Turin and Sudarium of Oviedo”). What is the “New Coincidence between Shroud of Turin and Sudarium of Oviedo” ? which is the science that studies pollen. because this study can be an extremely interesting work. and AFM observations can reveal the level of pollen erosion. And what is the difference about exine and intine ? How can change over the centuries the material of pollen? is proof that the shroud, which is kept in Turin, was a winding-sheet and was used according to rituals common in the Middle East over a thousand years ago. del crimen de Jesús de Nazaret”. entomophilous pollen material, meanwhile, forensic science has progressed. If the pollen grains are powdery, dust like, this is an indication about wind pollination. Usually pollen grains are sticky in insect pollinated flowers. I am still curious about that unsolved question. But I am still curious to follow what are the interesting observations. For now we can imagine something. through “calibrated optical observations” ? Earth’s Crust Emission in Holy Shroud Image Study. and Unusual Animal Behaviour in Western Piedmont. with chemical alterations of shallow geosphere (aquifers, soils) and the troposphere. Perhaps I “drank” too much knowledge with you. But the thirst for knowledge is never satisfied! (see also under : http://en.wikipedia.org/wiki/Palynology). Different forms of the exine surface. gemmate, clavate, verrucate, baculate, echinate, rugulate, striate or reticulate. an N-free polymeric substance belonging to the terpenes. of the most resistant substances in the plant world. >The outer layer, which often “peels off” is the perispore. myrrhoaloetic oils … !?!?) ? Where are the possible micro-observations about the Kirlian effect ? (= different kind of morphology for sporopolleninic wall)? Fungi and bacteria can breakdown the pollen. with pH over 6 pollen degradation can start (chemical corrosion). You would think someone at LiveScience would know better by now The Top Ten Relics of Christ?